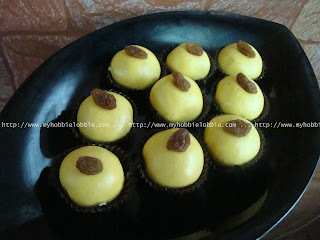 Today, I'm going to share with you a wonderful Indian sweet. This little gems make an appearance at every Indian festival. I love them so much that I can have them anytime of the year. I'm talking about none other than the famous Besan ke ladoo - famous in India atleast :) A "besan ka ladoo" is a little ball made out of sweetened chickpea flour, some clarified butter or ghee and flavored with some cardamom. Though this is not typically made for Christmas, I see no reason why it can't be included on the platter. Moreover, its simple to make and really quick to put together. The best part is that there is absolutely no wheat flour, this treat uses only chickpea flour, so even those on a gluten free diet should be able to enjoy them. They have a wonderfully nutty taste, they're creamy in texture and can be topped either with raisins or a piece of cashew nut or really anything else of your choice. I went with raisins this time. In a nonstick pan, over low heat melt the ghee and then tip in the chickpea flour (besan). Mix well and cook for about 7-8 minutes on low heat or till the mixture starts smelling nice and nutty. Keep stirring all the while so that it doesn't burn. Take off the heat and leave it to cool completely. Add the sugar and cardamom powder. Mix well and let the mixture sit for about 15 minutes. Divide into 24 portions and roll into small balls (ladoos). Place a raisin on top and this yummy treat is ready. Note: If the dough feels too soft when shaping into balls, don't worry. Shape them anyway and leave them to stand for about 15-20 minutes. The mixture should dry out a little during this time. Then re-shape them into balls and they should hold their shape now. I placed them in little brown paper cups. You can then easily place them in little boxes to give them away. 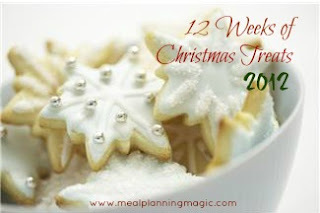 Don't forget to check what the others have put together for this weeks edition of 12 Weeks of Christmas Treats hosted by Brenda of Meal Planning Magic. I loves these - they sound delicious & I love that they are gluten free! Thanks Elaine, hope you enjoy it as much as we do! These intrigued me when I saw the picture. They are unique and look delicious. Nice presentation and they would work well in gift platters.